Dusty Wolfe got his first big break from Joe Blanchard’s Southwest Championship Wrestling..
January 1984: Dusty Wolfe moved on to Central States Championship Wrestling where he became a member of the “Uptown Boys”..
May 1984: Dusty Wolfe returned to Southwest Championship Wrestling to form a successful tag team with Ken Timbs..
~~~Dusty Wolfe & Ken Timbs worked for Jerry Jarrett in Memphis as the “Hollywood Blondes”..
~~~Late 1984: The Hollywood Blondes split up..
January 1985: Dusty Wolfe had a brief stint in Central States before returning to Southwest Championship Wrestling..
October 1985: Dusty Wolfe worked for Joe Savoldi’s ICW, where he reformed the Hollywood Blondes with Ken Timbs.. Dusty Wolfe continued working in different territories like Puerto Rico, Texas All Star Wrestling, World Class, and WWF..
1987: Dusty Wolfe worked part time in the World Wrestling Federation..
April 18, 1986–Superstars: The Can-Am Connection (Rick Martel & Tom Zenk) defeated Barry O & Dusty Wolfe. April 19, 1987–Wrestling Challenge: Jake Roberts defeated Dusty Wolfe. May 2, 1987–Superstars: The Can-Am Connection (Rick Martel & Tom Zenk) defeated Dusty Wolfe & Rocky Stone. May 30, 1987–Superstars: Ricky Steamboat defeated Dusty Wolfe. May 31, 1987–Wrestling Challenge: Koko B. Ware defeated Dusty Wolfe. June 13, 1987–Superstars: The British Bulldogs (Davey Boy Smith & The Dynamite Kid) defeated Dusty Wolfe & Johnny K-9. June 14, 1987–Wrestling Challenge: Brutus Beefcake defeated Dusty Wolfe. June 28, 1986–Wrestling Challenge: Hercules, King Harley Race & Paul Orndorff defeated Don Driggers, Dusty Wolfe & Rick Renslow. July 11, 1987–Superstars: The Can-Am Connection (Rick Martel & Tom Zenk) defeated Dusty Wolfe & Terry Gibbs. July 19, 1987–Wrestling Challenge: Jake Roberts defeated Dusty Wolfe. 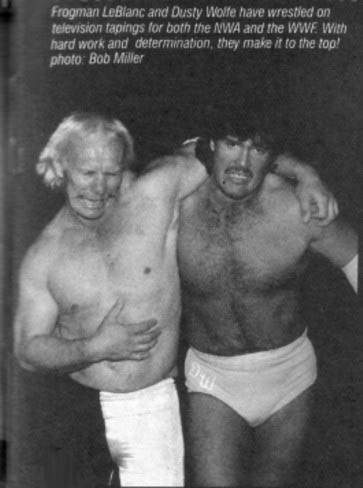 August 8, 1987–Superstars: George Steele defeated Dusty Wolfe. August 9, 1987–Wrestling Challenge: Brutus Beefcake & The Rougeau Brothers (Jacques Rougeau & Raymond Rougeau) defeated Dusty Wolfe, Iron Mike Sharpe & Mario Mancini. September 5, 1987–Superstars: Jake Roberts defeated Dusty Wolfe. September 20, 1987–Wrestling Challenge: The Heenan Family (Hercules, King Harley Race, King Kong Bundy & Rick Rude) defeated Brady Boone, Dusty Wolfe, Rudy Ryder & SD Jones. November 15, 1987–Wrestling Challenge: Jim Duggan defeated Dusty Wolfe. November 21, 1987–Wrestling Challenge: The British Bulldogs (Davey Boy Smith & The Dynamite Kid) defeated Dusty Wolfe & The Gladiator. November 28, 1987–Superstars: Koko B. Ware & The Young Stallions (Jim Powers & Paul Roma) defeated Barry Horowitz, Dusty Wolfe & Terry Gibbs. December 12, 1987–Superstars: The Ultimate Warrior defeated Dusty Wolfe. December 13, 1987–Wrestling Challenge: Strike Force (Rick Martel & Tito Santana) defeated Dusty Wolfe & Steve Lombardi. December 19, 1987–Superstars: Don Muraco defeated Dusty Wolfe. January 16, 1988–Superstars: Strike Force (Rick Martel & Tito Santana) defeated Dusty Wolfe & Iron Mike Sharpe to retain the world tag team titles. January 24, 1988–Wrestling Challenge: Brutus Beefcake defeated Dusty Wolfe. January 25, 1988–MSG Network: Omar Atlas defeated Dusty Wolfe. January 30, 1988–Superstars: Jake Roberts defeated Dusty Wolfe. January 31, 1988–Wrestling Challenge: The British Bulldogs (Davey Boy Smith & The Dynamite Kid) defeated Barry Horowitz & Dusty Wolfe. February 6, 1988–Superstars: Don Muraco defeated Dusty Wolfe. February 14, 1988–Wrestling Challenge: The British Bulldogs (Davey Boy Smith & The Dynamite Kid) defeated Dusty Wolfe & Jose Estrada. February 27, 1988–Superstars: Strike Force (Rick Martel & Tito Santana) defeated Dusty Wolfe & Tom Stone. March 6, 1988–Wrestling Challenge: The Ultimate Warrior defeated Dusty Wolfe. April 16, 1988–Superstars: The British Bulldogs (Davey Boy Smith & The Dynamite Kid) defeated Barry Horowitz & Dusty Wolfe. April 17, 1988–Wrestling Challenge: Strike Force (Rick Martel & Tito Santana) defeated Dusty Wolfe & Rick Renslow. July 9, 1988–Superstars: The British Bulldogs (Davey Boy Smith & The Dynamite Kid) defeated Dusty Wolfe & Gino Carabello. July 17, 1988–Wrestling Challenge: The Junkyard Dog defeated Dusty Wolfe. August 20, 1988–Superstars: The Ultimate Warrior defeated Dusty Wolfe. September 4, 1988–Wrestling Challenge: The Rockers (Marty Jannetty & Shawn Michaels) defeated Dusty Wolfe & Larry Stephens. January 22, 1989–Wrestling Challenge: The Blue Blazer defeated Dusty Wolfe. February 4, 1989–Superstars: The Rockers (Marty Jannetty & Shawn Michaels) defeated Bob Blake & Dusty Wolfe. February 12, 1989–Superstars: Jim Duggan defeated Dusty Wolfe. February 18, 1989–Wrestling Challenge: Demolition (Ax & Smash) defeated Chip Atkinson & Dusty Wolfe to retain the world tag team titles. February 25, 1989–Superstars: The Ultimate Warrior defeated Dusty Wolfe to retain the Intercontinental title. March 26, 1989–Wrestling Challenge: The Hart Foundation (Bret Hart & Jim Neidhart) defeated Dusty Wolfe & Iron Mike Sharpe. April 15, 1989–Superstars: Jake Roberts defeated Dusty Wolfe. June 17, 1989–Superstars: The Ultimate Warrior defeated Dusty Wolfe. June 25, 1989–Wrestling Challenge: The Bushwhackers (Butch & Luke) defeated Dusty Wolfe & Jim Merkel. July 8, 1989–Superstars: The Rockers (Marty Jannetty & Shawn Michaels) defeated Dusty Wolfe & Tony Burton. July 15, 1989–Superstars: The Fabulous Rougeaus (Jacques Rougeau & Raymond Rougeau) defeated Dale Wolfe & George Skaaland. July 30, 1989–Superstars: Dino Bravo defeated Dale Wolfe. August 12, 1989–Superstars: Ted DiBiase defeated Dale Wolfe. August 13, 1989–Wrestling Challenge: Rick Martel defeated Dale Wolfe. August 27, 1989–Wrestling Challenge: Mr. Perfect defeated Dale Wolfe. September 9, 1989–Superstars: The Powers Of Pain (The Barbarian & The Warlord) defeated Dale Wolfe & Tom Stone. September 17, 1989–Wrestling Challenge: Brutus Beefcake defeated Dale Wolfe. September 30, 1989–Superstars: Dusty Rhodes defeated Dale Wolfe. October 14, 1989–Superstars: The Ultimate Warrior defeated Dale Wolfe to retain the Intercontinental title. October 22, 1989–Wrestling Challenge: The Bushwhackers (Butch & Luke) defeated Boris Zhukov & Dale Wolfe. November 5, 1989–Wrestling Challenge: Dino Bravo defeated Dale Wolfe. December 16, 1989–Superstars: The Rockers (Marty Jannetty & Shawn Michaels) defeated Dale Wolfe & The Brooklyn Brawler. December 24, 1989–Wrestling Challenge: Bret Hart defeated Dale Wolfe. December 28, 1989–MSG Network: Tugboat Thomas defeated Dale Wolfe. December 31, 1989–Wrestling Challenge: Ronnie Garvin defeated Dale Wolfe. January 7, 1990–Wrestling Challenge: Dino Bravo defeated Dale Wolfe. January 13, 1990–Superstars: Ted DiBiase defeated Dale Wolfe. January 14, 1990–Wrestling Challenge: Rick Rude defeated Dale Wolfe. January 20, 1990–Superstars: Rick Rude defeated Dale Wolfe. February 4, 1990–Wrestling Challenge: Mr. Perfect defeated Dale Wolfe. February 25, 1990–Wrestling Challenge: Hercules defeated Dale Wolfe. March 3, 1990–Superstars: Roddy Piper defeated Dale Wolfe. March 18, 1990–Wrestling Challenge: Demolition (Ax & Smash) defeated Dale Wolfe & Steve Vega. March 25, 1990–Wrestling Challenge: Mr. Perfect defeated Dale Wolfe. March 31, 1990–Superstars: The Orient Express (Sato & Tanaka) defeated Dale Wolfe & Omar Atlas. April 22, 1990–Wrestling Challenge: Jim Duggan defeated Dale Wolfe. April 29, 1990–Wrestling Challenge: Jim Duggan defeated Dale Wolfe. May 13, 1990–Wrestling Challenge: The Genius defeated Dale Wolfe. May 26, 1990–Superstars: Rick Martel defeated Dale Wolfe. June 24, 1990–Wrestling Challenge: The Bushwhackers (Butch & Luke) defeated Bill Garlets & Dale Wolfe. June 30, 1990–Superstars: Tugboat defeated Dale Wolfe. July 8, 1990–Wrestling Challenge: Koko B. Ware defeated Dale Wolfe. August 25, 1990–Superstars: Dusty Rhodes defeated Dale Wolfe. September 2, 1990–Wrestling Challenge: Koko B. Ware defeated Dale Wolfe. September 16, 1990–Wrestling Challenge: Marty Jannetty defeated Dale Wolfe. December 2, 1990–Wrestling Challenge: Randy Savage defeated Dale Wolfe. January 27, 1991–Wrestling Challenge: The Bushwhackers (Butch & Luke) defeated Dale Wolfe & Pat Rose. February 2, 1991–Superstars: Shane Douglas defeated Dale Wolfe. February 9, 1991–Superstars: The Hart Foundation (Bret Hart & Jim Neidhart) defeated Dale Wolfe & Doug Vines in a dark match. February 10, 1991–Wrestling Challenge: The Texas Tornado defeated Dale Wolfe. February 23, 1991–Superstars: Sgt. Slaughter defeated Dale Wolfe. February 24, 1991–Wrestling Challenge: Rick Martel defeated Dale Wolfe. March 9, 1991–Superstars: Haku & The Barbarian defeated Dale Wolfe & Randy Hunter. March 17, 1991–Wrestling Challenge: The Rockers (Marty Jannetty & Shawn Michaels) defeated Dale Wolfe & John Allen. March 24, 1991–Wrestling Challenge: The Undertaker defeated Dale Wolfe. March 30, 1991–Superstars: Power And Glory (Hercules & Paul Roma) defeated Dale Wolfe & John Allen. April 6, 1991–Superstars: Mr. Perfect defeated Dale Wolfe to retain the Intercontinental title. April 20, 1991–Superstars: The Warlord defeated Dale Wolfe. April 28, 1991–Wrestling Challenge: The Orient Express (Kato & Tanaka) defeated Dale Wolfe & Jim Evans. May 5, 1991–Wrestling Challenge: Jim Duggan defeated Dale Wolfe. May 12, 1991–Wrestling Challenge: Virgil defeated Dale Wolfe. May 26, 1991–Wrestling Challenge: The Bushwhackers defeated Dale Wolfe & The Brooklyn Brawler. June 26, 1991–Superstars: The Dragon defeated Dale Wolfe. November 30, 1991–Superstars: Jim Duggan & Sgt. Slaughter defeated Dale Wolfe & Paul Perez. December 3, 1991–This Tuesday in Texas: Sir Charles defeated Dale Wolfe in a dark match. December 15, 1991–Wrestling Challenge: Ted DiBiase defeated Dale Wolfe. December 28, 1991–Superstars: Rick Martel defeated Dale Wolfe. January 18, 1992–Superstars: The Nasty Boys (Brian Knobbs & Jerry Sags) defeated Dusty Wolfe & Robert Taylor. February 2, 1992–Wrestling Challenge: Jake Roberts defeated Dale Wolfe. February 8, 1992–Superstars: Papa Shango defeated Dale Wolfe. February 16, 1992–Wrestling Challenge: El Matador defeated Dale Wolfe. February 29, 1992–Superstars: Jim Duggan & Sgt. Slaughter defeated Dusty Wolfe & Rudy Gonzales. March 14, 1992–Superstars: Sid Justice defeated Dale Wolfe. March 21, 1992–Superstars: The Mountie & The Nasty Boys (Brian Knobbs & Jerry Sags) defeated Bill Wood, Dale Wolfe & Scott Summers. March 22, 1992–Wrestling Challenge: Bret Hart defeated Dale Wolfe. March 28, 1992–Superstars: The Natural Disasters (Earthquake & Typhoon) defeated Bob Morgan & Dale Wolfe. April 11, 1992–Superstars: Shawn Michaels defeated Dale Wolfe. June 13, 1992–Superstars: Kamala defeated Dale Wolfe. July 6, 1992–Wrestling Challenge: Ric Flair defeated Dale Wolfe. October 31, 1992–Superstars: Tatanka defeated Dale Wolfe. November 8, 1992–Wrestling Challenge: Marty Jannetty defeated Dale Wolfe. December 5, 1992–Superstars: Jim Duggan defeated Dale Wolfe. January 3, 1993–Wrestling Challenge: Bob Backlund defeated Dale Wolfe. January 17, 1993–Wrestling Challenge: The Undertaker defeated Dale Wolfe. January 23, 1993–Superstars: Kamala defeated Dale Wolfe. February 7, 1993–Wrestling Challenge: High Energy (Koko B. Ware & Owen Hart) defeated Dale Wolfe & Ken Johnson. April 10, 1993–Superstars: Lex Luger defeated Dale Wolfe. April 24, 1993–Superstars: Shawn Michaels defeated Dale Wolfe. June 5, 1993–Superstars: The Smoking Gunns (Bart Gunn & Billy Gunn) defeated Dale Wolfe & Gus Kantarakis. Dusty Wolfe worked part time for WCW from 1995 until late 1998..
November 3, 1995–CWA: Hector Guerrero defeated Dale Wolfe. January 13, 1996–Saturday Night: Meng defeated Dale Wolfe. January 27, 1996–WCW Saturday Night: Lord Steven Regal defeated Dale Wolfe by disqualification. February 17, 1996–WCW Saturday Night: Alex Wright defeated Dale Wolfe. October 19, 1996–WCW Saturday Night: The Renegade defeated Dale Wolfe. Dusty Wolfe made numerous overseas tours in South Africa, England, Malaysia, Singapore, Japan, Korea, Greece and India! Dusty Wolfe also worked for AAA & EMLL promotions in Mexico..
October 29, 1999–NWA Southwest: Doink defeated Devil Dupree. August 1, 2002–NWA Southwest: Doink defeated Psycho Simpson. September 19, 2004–American Wrestling Empire: Dusty Wolfe defeated Max Muscles..
November 5, 2004–XCW: Dusty Wolfe defeated Bullman Downs. November 12, 2004–XCW: Kit Carson defeated Dusty Wolfe. January 7, 2005–XCW: Dusty Wolfe defeated Drunk Adam. April 29, 2005–XCW: Eddie Atlas defeated Dusty Wolfe, Jacob Ladder and The Bull in a 4-way match. 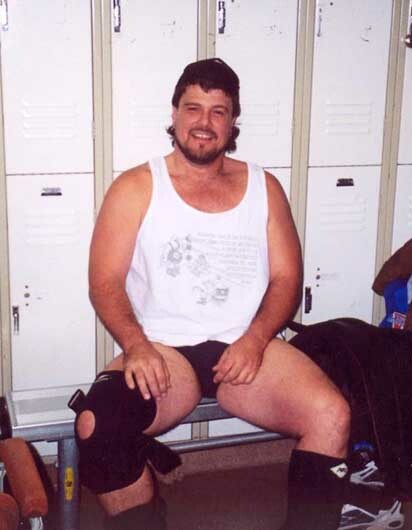 May 20, 2005–Xtreme Championship Wrestling: Dusty Wolfe beat Dave the Rave to retain the Iron Man title..
June 24, 2005–XCW: Dusty Wolfe & Kit Carson defeated Dave The Rave in a handicap match to retain the Iron Man title. July 15, 2005–XCW: Doink defeated Disco Inferno. July 29, 2005–XCW: Dusty Wolfe beat Sidd Murder to retain the Iron Man title with help from the Brown Brothers..
September 23, 2005–XCW: Jack Drastic defeated Dusty Wolfe. November 19, 2005–Mid South Wrestling Alliance: Doink the Clown (Dusty Wolfe) defeated Shawn Sanders w/Moustafa Sharmout..
January 7, 2006 – CTPW: Dusty Wolfe defeated Blue steel..
January 15, 2006–Mid-South Wrestling Alliance: Doink the Clown (Dusty Wolfe) defeated Seth Allen..
February 18, 2006–IZW: Brad Michaels & Seth Allen defeated Mr. Wrestling III & Slash. April 2006: Doink The Clown (Dusty Wolfe) went on tour in Korea, Japan, Guam, and Hawaii (Virgil defeated Doink)..
July 7, 2006–Legends: Aeon Flexx & Don Bass beat Deathwish & Dusty Wolfe | Rick Steiner beat Mr. Wrestling III (masked Dusty Wolfe)..
July 23, 2006–Downsouth Championship Wrestling: Dusty Wolfe defeated Alvin “The Apostle” Breaux | Doink the Clown beat Tony Vega..
August 1, 2006–ICW: Doink defeated Mario Valenta. August 20, 2006–Downsouth Championship Wrestling: Tony Vega defeated Dusty Wolfe..
February 4, 2007–TWE: Doink defeated Rude Boy Gonzales. March 8, 2007–ICW: Doink defeated Santos Hernandez. March 10, 2007–Flemish Wrestling Force: Rob Raw vs. Doink the Clown (Dusty Wolfe) ended in a No Contest..
~~~Rob Raw & Doink the Clown defeated Heaven & Earth (Gangreen & Angelfyre) to win the FWF Tag Team titles..
~~~Heaven & Earth beat Rob Raw & Doink and German Suicide and Soldiers Of Fortune to win the Tag Team titles! March 18, 2007–ICW: Black Dragon defeated Doink. March 22, 2007–ACW/IWA-Texas: Dusty Wolfe defeated Berry Breeze. April 1, 2007–TWE: Dusty Wolfe defeated Brett Thunder to become #1 contender for the Television title. Skitzo defeated Dusty Wolfe to retain the Television title. April 7, 2007–TWE: Rudy Russo defeated Doink. April 12-14, 2007–ICW: Doink defeated The Shogun Assassin. April 17, 2007–ICW: Virgil defeated Doink. April 18-19, 2007–ICW: Lil Nate defeated Doink. April 20, 22, 24-29, 2007–ICW: Doink defeated The Black Sabbath. May 1, 2007–ICW: Lil Nate defeated Doink. May 18, 2007–ICW: Disco Inferno defeated Doink. May 26, 2007–Anarchy Championship Wrestling: Rory Fox defeated Doink The Clown (Dusty Wolfe)..
May 27, 2007–ACW/IWA Texas: Tony Vega defeated Dusty Wolfe. June 1, 2007–XCW: Rexx Reed defeated Dusty Wolfe. June 9, 2007–ICW: Doink defeated Johnny Rage. Dusty Wolfe & Terry Daniels defeated Aaron Neil & Ryan Davidson. June 30, 2007–ICW: Doink & Shawn Vexx defeated Chris Thomas & Shane Williams. Dusty Wolfe defeated Renegade. July 8, 2007–ACW/IWA Texas: Rory Fox defeated Dusty Wolfe. July 14, 2007–TWE: Mr. Wrestling III defeats Skitzo to win the Television title. July 22, 2007–TWE: Mr. Wrestling III defeated Big Dogg to retain the Television title. July 22, 2007–BIW: Bobby Von Neil, Braydin Payge & Jordan defeated Dusty Wolfe, Jay & Joey Spector. August 17, 2007–ICW: Doink defeated Shawn Vexx. August 19, 2007–ACW/IWA Texas: Double Trouble (Chris James & Tony Vega) & Dusty Wolfe defeated Julio Garza, Matt Garza & Ricky Rhodes. September 9, 2007–ACW/IWA Texas: Double Trouble (Chris James & Tony Vega), Dusty Wolfe & Rob Raw defeated Chad Thomas, Mr. Destiny, Ricky Rhodes & Steve DeMarco. September 22, 2007–ICW: Disco Inferno defeated Doink. October 18, 2007–ICW: Disco Inferno defeated Doink. October 21, 2007–ACW/IWA Texas: Double Trouble (Chris James & Tony Vega) defeated Dusty Wolfe & Ken Johnson. November 7, 2007–TWE: Mr. Wrestling III defeated James Claxton by disqualification to retain the Television title. November 14, 2007–TWE: Mr. Wrestling III defeated Brett Thunder to retain the Television title. November 28, 2007–TWE: James Claxton defeated Mr. Wrestling III to win the Television title. November 30, 2007–XCW: Kit Carson defeated Doink. December 7, 2007–ICW: Cameron Cage defeated Doink. February 1, 2008–DWA: Sniper defeated Doink. February 2, 2008–DWA: Doink & The Honky Tonk Man defeated Kenzo Richards & Mark Kodiak. Mr. Wrestling III defeated Rob Raw to win the Star Yield Asian Junior Heavyweight title. February 17, 2008–BIW: Best Friends Forever (??? & ???) defeated Dusty Wolfe & Spoiler 2000. March 20, 2009–FWF: Doink defeated Boomer. Mot van Kunder & Tornado Tequila defeated David Steel & Silver Bullet and Dusty Wolfe & Jack Demento in a 3-way tag team match to retain the tag titles. Dusty Wolfe also won a battle royal. March 21, 2009–Wrestling Legends Tour: Karsten Kretschmer defeated Doink. March 22, 2009–Wrestling Legends Tour: The Honky Tonk Man defeated Doink and Eugene in a 3-way match. November 28, 2009–XCW: Doink defeated Nasty Nick. February 19, 2010–ICW: Disco Inferno defeated Doink. May 8, 2010–ICW: Raven defeated Doink. December 10, 2010–WOW: Ricky Douglas defeated Doink. February 25, 2012–ICW: Abdul Bashir defeated Doink.